GURPS March 23, 2019: Happy Birthday, Bullet Dice! [GURPS] March 23, 2019: Happy Birthday, Bullet Dice! Thread: March 23, 2019: Happy Birthday, Bullet Dice! March 23, 2019: Happy Birthday, Bullet Dice! 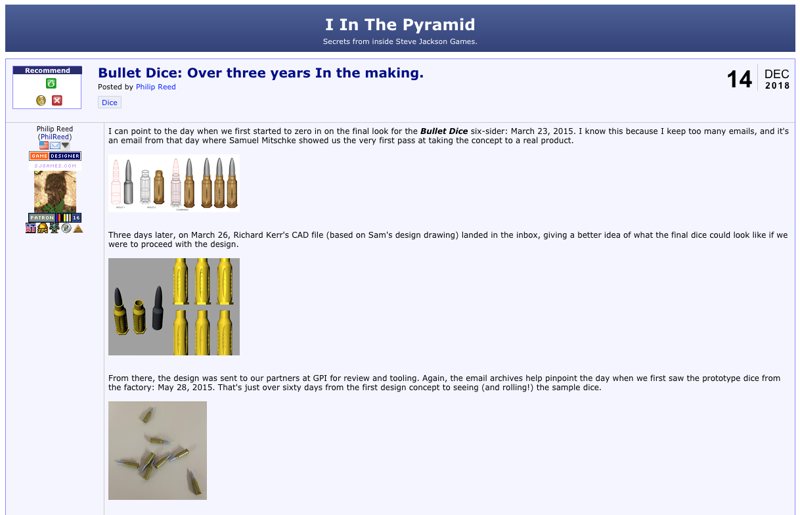 It was four years ago today that the first design drawings for the Bullet Dice project were completed and set us on the path to creating these new six-sided dice. We released the dice last month, and we're happy to report that they turned out better than we had expected! The double-injection process is awesome and a trick we'll visit again in the future. If you would like to know more about how these were created*and would like to see the early design images, check this blog post at BoardGameGeek! Is this world getting you down? Need some new scenery? Consider starting your own space colony! With GURPS Space and Pyramid #3/6: Space Colony Alpha, you'll have the tools you need to explore the idea of a new home just about anywhere in the galaxy. Make a download from*Warehouse 23 your first stop on the trip of a lifetime.